Hello and welcome to my Jarvis standing desk review. Are you considering buying the Jarvis desk by Fully? Here is a full review of the electric sit/stand desk that I rated as the number one overall standing desk. Here we’ll look at how it stands (no pun intended) compared to other options. The Jarvis desk combines a quality build with an attractive price. You don’t want to go cheap and end up with something that won’t last but at the same time, you don’t want to break the bank getting a standing desk. This is where the Jarvis desk falls, right in between those 2 extremes and makes it perfect for the average person. The combination of quality and price put this above all other desks in my opinion. It offers a 7-year warranty which means you are getting a good product that is going to last you quite a while. 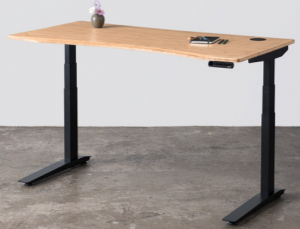 If you go with the desk frame itself and then add your own tabletop you could come away with a full desk under $550. If you go with all of the options it may end up over $1,000. It just depends on what you are looking for. But for most people, this is the ideal desk to buy. The Jarvis comes with 2 different frame options, and just to be clear the one I am primarily reviewing here is the larger base that outdoes the smaller frame in every category. If you don’t need the extra height you can always go with the smaller frame, but I think the larger frame is going to be the better overall purchase. The larger frame size as mentioned above ranges from 23.25″ to 48.75″ (without the tabletop) while the smaller frame ranges from 26.5″ to 45.75″. The most intriguing thing about the Jarvis desk is that even if money was no issue it would still be one of the best desk’s you can buy. However, the fact that you can get this desk at an affordable price is why I consider the Jarvis desk to be the best overall desk to buy. The cheapest way to buy would be to buy the frame, currently on Amazon for $460, and then add a cheaper tabletop option leaving your total expenditure around $530. Or, they may possibly have desks on clearance as well. Now, you can always go with their tabletop options like the bamboo tabletop which would make the price roughly $685. However, if you added all of the accessories that are offered you could spend over $1,000 and if you went with the hardwood top and added all of the accessories you could even push 2 grand. But, none of that is necessary. Spending $700 on this desk may sound like a lot of money, but not when comparing it to other desks that have the same quality and cost well over a thousand dollars. Considering the 7-year warranty and assuming the desk would only last 7 years. Then that is $100 a year, or breaking it down further would be $8.33 a month. Not a bad investment. Without a good warranty, I wouldn’t even consider buying something that costs several hundred dollars. The fact that you get a full 7-year warranty that covers all frame, mechanical, and electrical parts, means that you are going to get a solid product. The last thing you want to do is buy something that lasts for a year and then breaks. With a warranty, you know that if something goes wrong, you can get it taken care of. As for size, you can go with a tabletop option that is less than 4 feet wide and only 2 feet deep. Or you can go with a desk as wide as 82 inches and 3 feet deep. So it is quite versatile depending on how much space you have. Whether you are looking for a large desk or a small desk this should work for you. 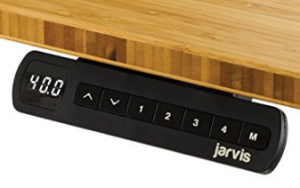 Again, another great thing about the Jarvis Desk is that you can just add your own desktop to it if you don’t want to include their tabletops because of the price. If you decide to go with what Fully offers they have sleek options that include their most infamous style, the bamboo top. Or they offer laminates that include black, graphite, white, or a Greenguard laminate made from recycled wood fiber. If you want their high-end option they offer reclaimed wood or “handcrafted” hardwood. These will be thicker at 1″ and longer lasting but will push your overall purchase to around $1000. The Jarvis desk has a very good height range going all the way down to 2 feet off the ground (low enough for most children), to 48.75 inches high not including a tabletop. Assuming you go with the smallest tabletop height and your desk is 49.5 inches tall, then that means someone 6’8 inches could use this desk. The recommended tallest height they give is 6’6″ but considering you can add a monitor arm it could fit someone 6’7″ comfortably, and depending on the person, could be tall enough for someone 6’9″ if you don’t mind keeping your hands a little bit lower to type. You would need to add a monitor arm though, to make the monitor tall enough. Overall, this desk is tall enough for most people and won’t at all be an issue unless you’re pushing 7 feet tall. Most of the reviews stated this desk has very little wobbliness, even while at its top height. Of course, this is going to be one of the most important aspects when looking at getting a standing desk. The Jarvis outperforms other desks in its price range in this area. Granted, there was “some” wobbliness reported, but not enough to make it an issue in any way. The weight capacity for this is 350 pounds. So Shaquille O’neal could sit on this desk without breaking it. In other words, you will have no issues whatsoever using multiple monitors and adding things on top of your desk at the same time. It comes with an LED lit 4 preset height option handset that allows easy up and down adjustment. Most reviews on this item were positive and I there are not many complaints of any issues with this working any other way than it is supposed to. You can also just use up and down arrows in case you for whatever reason don’t want to use the preset options. Other than the handset that it comes with, you can add a number of items including: a monitor/dual monitor arm, wire grommets, a wire management bundle, CPU holders, swivel pencil trays, desk lamps, and standing mats. None of these accessories are necessary but I do recommend a monitor arm and standing mat. The Jarvis moves up and down at 1.5″ per second if you go with the larger frame and 1.3″ per second if you go with the smaller frame. At 1.5″ per second this puts it towards the top of the list for speed on electrical desks. This isn’t going to be as fast as what you could adjust a desktop converter or a manually adjusting desk but is still fast enough that it isn’t an issue adjusting. Any electric sit/stand desk is going to make some noise when you adjust it. The Jarvis desk isn’t the quietest desk there is on the market, but it’s not too far off either. The operating noise is listed at less than 50 decibels. So let’s just say 50 decibels. This isn’t too bad at all. Even in a library, it wouldn’t be that noticeable. Overall Fully seems to come through with quality customer service. They offer just about anything you need when it comes to standing desks and they back up their products with a quality customer service team and warranty. I think their website could use some upgrading as trying to choose your desk with options on their site gets confusing which is why I recommend purchasing through Amazon. Check out this full video review to see it in action. So yeah, this is a really solid, yet highly affordable desk, which is why I rated it the best overall sit/stand desk. You can either go with the frame and tabletop from them. Or buy the frame separately and try to make your overall purchase less. At the end of the day if you are looking for a great desk then going with the Jarvis Desk is highly recommended. As I started my online business, I’ve been looking for a desk and I’ve heard good hings about standing desks and that it’s a good addition to home offices. 🙂 I like how this desk look simple and cozy, not too complicated like some of the others I’ve seen. This is a timely review for me, as i have lately developed pains in my shoulders from sitting and typing on my laptop on a fixed height table. I have been thinking about working standing up, but this desk gives you the option to alter the height. This means i can vary the height, not have a fixed height for working. I will definitely be looking into it, thanks for the review. Hey Greg, thanks for the comment. Yes, it helps to stand but still have the option to sit when you want. Good luck finding something that works for you.